You've got items to recycle in the kitchen, so why not create a recycling center here? You've got items for recycling - especially in the kitchen. Why not create your own kitchen recycling center here? A pull-out trash can under the sink is a great place to stash plastic tubs for recycling aluminum, glass, and plastic. The containers are out of sight - but still in the thick of things so you don't forget to put it outside with the trash containers on pick up day. 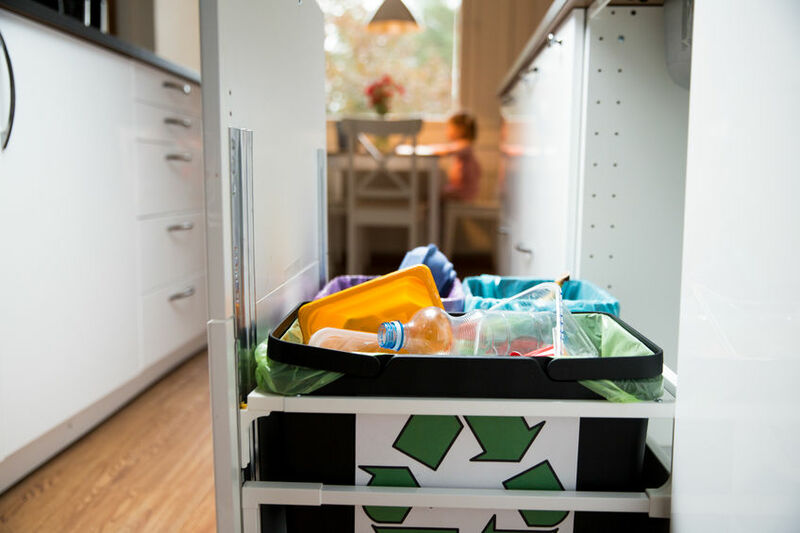 If space for a kitchen recycling center is tight, consider keeping plastic storage bins or recycling containers for recycling cans, glass, plastic and paper in the garage, where items can be unloaded and stored until pick up day. Let the kids do this. They'll love it. They'll even like taking it out to the garage. Really. And while you're at it, start a composting pail or compost bin (with a tight-fitting lid) with non-meat table scraps. You can add this to your composting pile or worm bin (another great kid project). All those leftovers that go down the garbage disposal can instead enjoy a second life in your backyard garden in just a few short months. It's the ultimate recycling that gives back - you can use the composted material to feed and grow your backyard garden. Yes, composting usually requires worms - they're great at speeding up the compost cooking process. But if worms make you squeamish, you can compost without worms. Get started making compost happen in your home here. Prefer the wormless approach? Here's how to get started. While storing a compost pile beneath the kitchen sink is a good idea, while we're thinking about the sink, let's talk about what not to keep under there. Do not store poisons, such as cleaners and bleach, under the sink. It's a bad idea with those little ones in your home. This is not one of those times that you want to have logical stuff (like drain cleaner) handy. Homes with kids should have cleaners and other dangerous brews stored up high and out of reach in the garage.